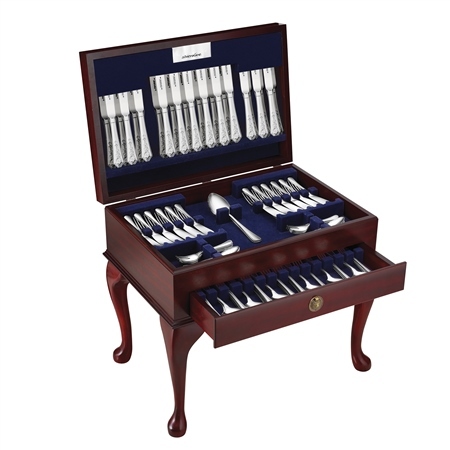 The Newbridge Silverware E.P.N.S cutlery collection is distinguished by wonderful craftsmanship, detailed finishes and superb quality materials making it an ideal gift for those who appreciate the finer things in life. This 127 piece set consists of 12 table knives, 12 table forks, 12 dessert/salad knives, 12 dessert/salad forks, 12 dessert spoons, 12 soup spoons, 12 teaspoons, 12 pastry forks, 12 fish knives, 12 fish forks, 4 table/serving spoons and a 3 piece carver set. The free standing Ashford canteen cabinet is the ultimate option in the Newbridge Silverware range and is an item that will never go out of style. This can accommodate a 12 place setting and carving set. The Ashford canteen cabinet adds a touch of class to any dining room and when not in use is a stunning piece of furniture with its exquisite Mahogany finish and ornate legs.